Permission to come aboard ? Always! If you share any of the 3 objetives of the United States Power Squadrons organization as education of members , participation in civic programs, and the creation of an atmosphere of friendship and camaraderie , you will learn and have fun at the same time with San Juan Power Squadron. You can start saving with the membership on classes and seminars at great discounts vs public price. Also visit the member's benefits page to enjoy other discounts at stores and have more reasons to join San Juan Power Squadron. 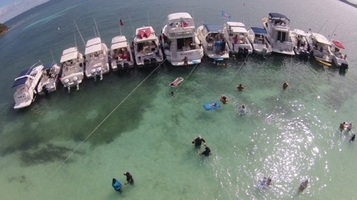 If you are new to boating we recommend you take the America's Boating Course® ( no longer a membership requirement ) and receive your Puerto Rico D.R.N.A navigation license permit. If you want to join our organization, already a member for renewal or transfer from any fellow squadron, see membership table below. Our Membership Chairman Lt/C. Ricardo Negron Yunque will answer your questions and handle the paperwork for you. Membership can be as an individual or as a whole family. Download your written registration form, fill and send to secretario@sanjuanpowersquadron.org or call 787-344-7577 with Lt/C Roberto Rivera, AP to request more information. These can be paid by filling out this credit card authorization form and send it to : secretario@sanjuanpowersquadron.org or by PayPal, by selecting the Buy Now that applies to you below. 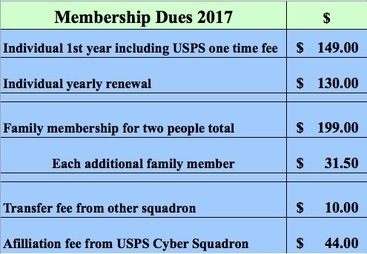 ** A non affiliated USPS Cyber Squadron Member must join San Juan Power Squadron before enjoying the member's benefits on our social activities.